A new cryptic species of the genus Hoplobatrachus from Cox’s Bazar district of Bangladesh is described and compared with its relevant congeners both in morphology and mitochondrial gene sequences. 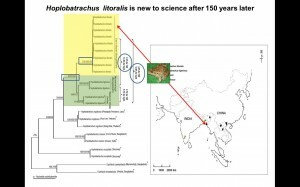 Based on mtDNA data, this new species was proved to genetically divergent from H. tigerinus at 3.2% for the 16S rRNA gene and 14.2% for the Cytb gene. 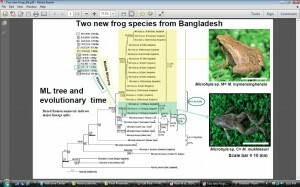 The known distribution range of the new species is restricted to southeastern corner of Bangladesh and it seems to endemic in this coastal belt. It is new to the genus Hoplobatrachus after 150 years later.